The company behind the Russell 3000 index is leaning in the direction of excluding companies that give investors only limited voting rights. Meal kit delivery company Blue Apron Holdings Inc. (APRN - Get Report) sought to protect itself from a potential onslaught of activist hedge fund managers by issuing three classes of shares in its IPO last month, including one that gives its CEO and insiders stakes with ten votes per share. The goal was to allow the company to grow independently without worrying about being pressured by an insurgent investor into a sale. However, that move may be backfiring. The FTSE Russell, the company behind the Russell 3000 index, is moving in the direction of excluding companies from its indices that issue shares with either only non-voting rights or those that give outside investors very limited voting rights. Blue Apron falls into that second category. If the FTSE adopts a proposal it has under consideration, as many expect, it would likely represent a major defeat for Blue Apron, Snap Inc. (SNAP - Get Report) and other companies that give insiders control of the votes. The proposal was prompted by institutional investor outrage in response to a move by Snap's underwriters to take the company public in March with only non-voting shares. However, it will also have wide ranging implications for Blue Apron and other IPOs as well. Many big index funds, exchange-traded funds, and public pension funds invest passively following major indices, such as the Russell 3000. Exclusion from the index will likely mean that major institutional investors including big pension funds and many index funds, won't be investing in the company. Prospects that Blue Apron won't be included in one or more indices are likely weighing down Blue Apron's share price. The meal kit company went public shortly after the Whole Foods acquisition was announced, pricing at the bottom of an already slashed valuation. Shares closed Monday at $6.59 a share, or 34% below its IPO price. James Chadwick, a portfolio manager at activist fund Ancora Advisors, suggested that some investors may choose not to invest in a particular company if they know that it won't be included in an important index. "Some investors will think that this is going to impact the long-term liquidity and overall valuation of a particular company because you are shrinking your buyer universe," he said. The FTSE Russell which expects to reach an official decision this month has issued a proposal that would require at least 5%, 10% or 25% of the votes be in the public sphere. Ken Bertsch, chief of the Council of Institutional Investors, said he calculates that Blue Apron would not be eligible, in its current form, for the FTSE Russell indexes even if the index firm requires only that 5% of votes be in public hands. Blue Apron has three classes of shares: One that gives investors a vote per share, another that gives its CEO and other insiders' shares with ten votes each and yet another that is made up of only non-voting shares. Bertsch notes that there are 30 million votes with Class A shares and about 1.6 billion votes attached to insider Class B shares, based on the 157 million Class B shares outstanding as of May 31. As a result, shares with one vote per share account for less than 2% of the voting float. That's far below the 5% threshold in the FTSE Russell proposal. It's possible that Blue Apron could issue more Class A shares to the public and that could get them past the necessary threshold. However, a requirement that 25% of votes be in public hands would be a much more difficult minimum to get over. In addition, two other major index providers, S&P Dow Jones Indices, which produces the S&P 500 index, and MSCI are also looking at the issue, which could mean added trouble for Blue Apron and Snap. (MSCI - Get Report) MSCI on June 12 issued a consultation seeking to identify whether it should include companies with non-voting shares or shares where outsiders have only low voting power in its indices. The review, which closes Aug. 31, comes after MSCI determined that "market participants" indicated that non-voting securities "may lead to a deterioration in corporate governance." In the meantime, it added companies without any listed voting shares are not eligible for the index. 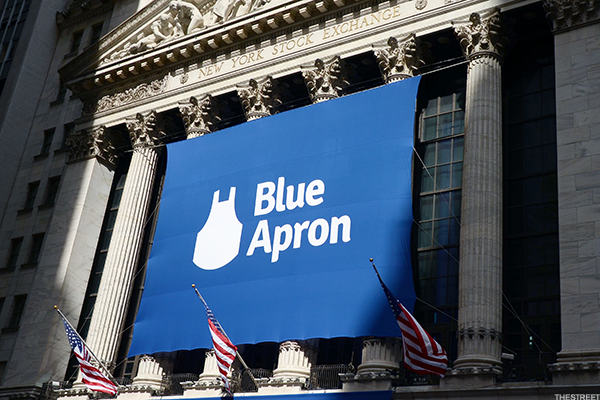 The low voting index provider issue is just the latest to have hit Blue Apron. In addition, the meal kit delivery company has already been hammered by Amazon.com Inc.'s (AMZN - Get Report) $13.7 billion acquisition of Whole Foods Market Inc. (WFM . On July 6 Amazon issued a trademark application seeking to compete with Blue Apron's meal kit business. That move also helped drive Blue Apron's shares downwards. Blue Apron did not respond to a request for comment. The company's shares fell 3.5% to $6.36 by Tuesday's close.